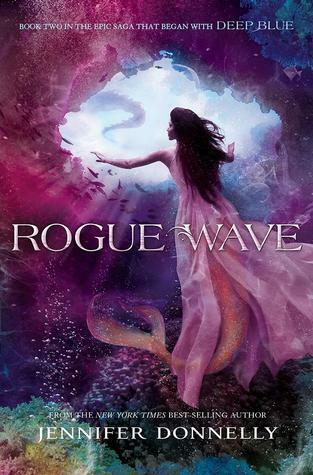 Presenting Waterfire Saga #2 Rogue Wave by Jennifer Donnelly. Underwater plots, fishes, mermaids and whatnot. After an elegantly portrayed stepping stone for the beginning with "Deep Blue", we head headlong with the sequel for some "Rogue Wave"(s). Our 5 merls Serafina, Neela, Ling, Ava and Astrid are descendants of the six who ruled over the lost city of Atlantis. The first book saw the river witch call them from across the vast water bodies and made aware of an ancient evil waking up again. But only special talismans owned by the ancient six could be used to defeat this demon. Thus Sera, Neela, Ling, Ava and Astrid head out in Rogue Wave to discover those artifacts. The sequel only focuses on Serafina and Neela's and in part Ling's journey as they head to Miromara and Matali respectively to search for their talismans. Although the home conditions they find are not something to boast off. Miromara as we know in the first book was attacked by and taken over by Traho and when Neela tries to raise the alarm in Matali she is declared touched in the head. Things happen as they always do. Sera learns what happened to her people after she escaped the attack and Neela knowing that her bureaucrat country (& parents) would never be able to help not until all the right papers have been filled. So Neela takes matters into her own hands and goes to the dragon's next (literally) to get her talisman. Sera on the other hand has to deal with a lot of shocks. The truth of Mahdi (her betrothed & lover) and of the mysterious Blu are revealed ...... Come on that one was at least obvious, we all knew it and speculated it after reading Deep Blue. As I said above we had a lot of revelations, that in turn raised a lot of questions. Sera and Mahdi ..... I really don't want to spoil anything but suffice it to say they resolved their issues and be done with it. It was really a wonder just how mature both Sera & Neela had gotten through their ordeal but are stubborn and resourceful Merls and have learned from their mistakes well. Rogue Wave is a sequel that doesn't really have much going on but what does happen and what gets revealed were very important. Jennifer Donnelly has improved much with this sequel. The one problem I have had with this series was the pacing. Deep Blue while essentially I liked very much had pacing problem. Without establishing a few key points there seemed to be a lot of things happening all at once. Rogue Wave rectified a bit more on the problem and the story flowed a lot better this time. It didn't go too slow and it didn't go too fast and that is just how I like it. Besides these gorgeous covers, how can you really deny it .... *fingers-crossed* lets hope the third book improves on it and comes out much better than its two predecessors. "A fast and excitingly adventurous read. Rogue Wave scents of the battles yet to come"